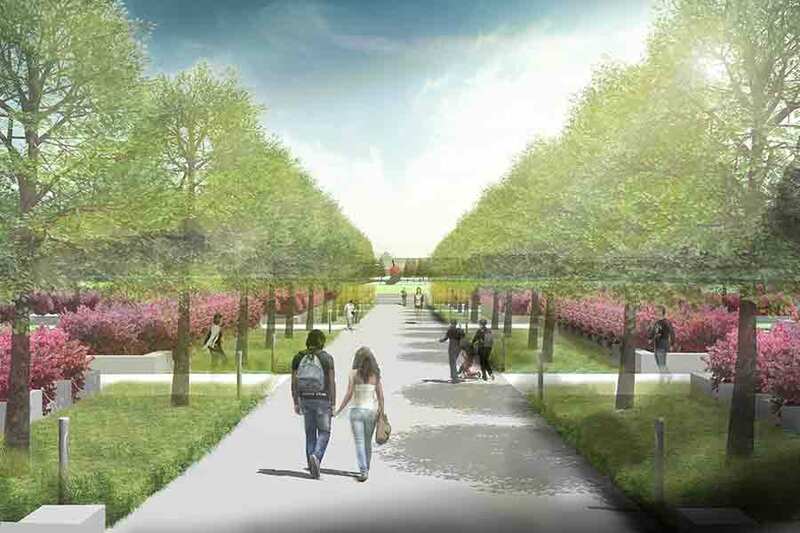 The Minneapolis Sculpture Garden, part of the Walker Art Center campus, is set to reopen after the completion of the Minneapolis Sculpture Garden Reconstruction Project. Opened nearly 30 years ago, the garden was one of the first such major sculpture parks in the United States, attracting over nine million visitors in that time. When reopened, visitors will be able to see 18 new art pieces, along with the 42 pieces that were already on display before the renovation. Six new pieces were commissioned specifically for the garden. The commissioned artists include Nairy Baghramian, Frank Big Bear, Theaster Gates, Mark Manders, Philippe Parreno, and Aaron Spangler. Additional works were collected from local and international artists, including Katharine Fritsch, Robert Indiana, Sol LeWitt, and Eva Rothschild. 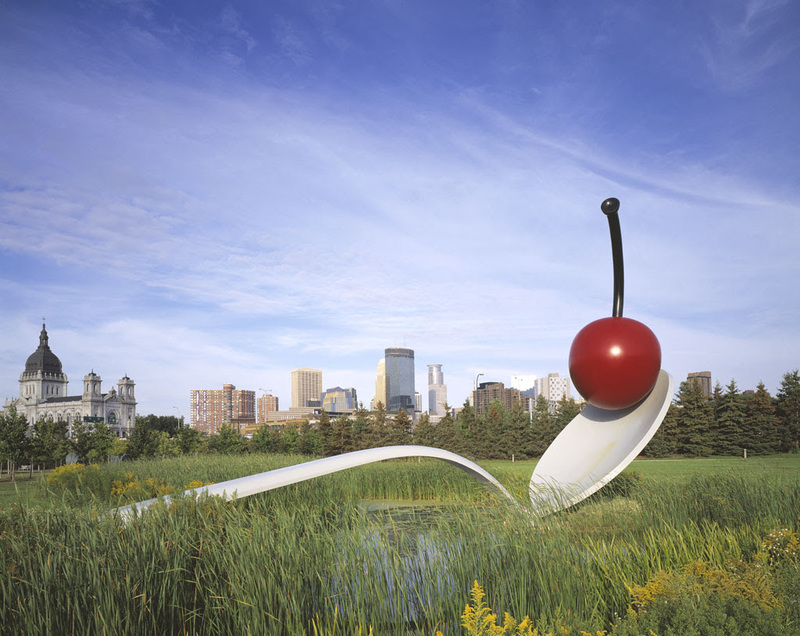 The crowd favorite Spoonbridge and Cherry by Claes Oldenburg and Coosje van Bruggen will also once again be on prominent display. The design of the 19-acre garden and Walker grounds has been carried out over the years by a number of renowned landscape designers including Edward Larrabee Barnes, Peter Rothschild, Michael Van Valkenburgh, Barbara Stauffacher Solomon, Tom Oslund, and Julie Snow. The renovations included the reconstruction of the garden’s infrastructure to make the park more sustainable and improve the parks water management. The $10 million project includes a completely new stormwater management system which includes an 80,000-gallon underground cistern. The new system allows for all rain that falls on the site to be captured and reused for irrigation. The garden's north end features a new native plant meadow and 300 new trees have been planted across the site, all adding to the gardens ecological design. The Walker Art Center also added a green roof over its main entrance and an additional green streetscape. The reopening will be marked by a number of festivities, including a full day of opening ceremonies on June 3rd. 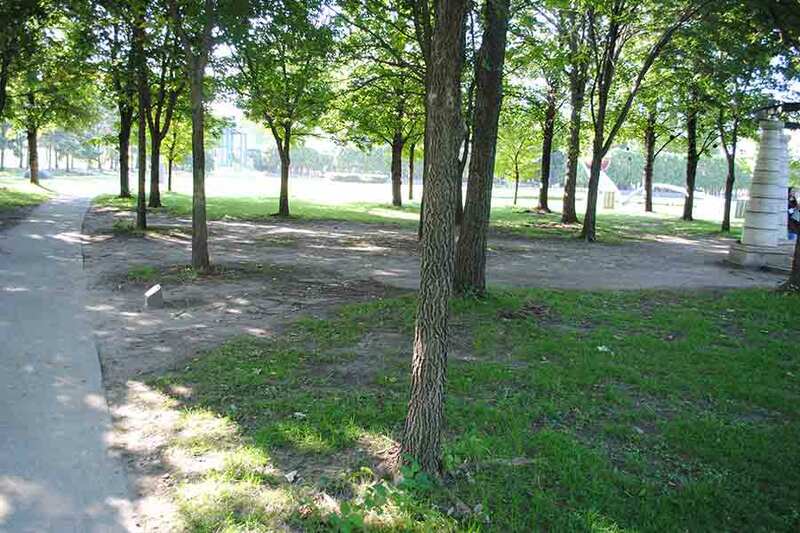 The Walker Art Center will also provide free gallery admission form June 1-June 10 in honor of the gardens reopening. Home. Everyday. Ordinary. These words describe what binds the three summer exhibitions at the Pulitzer Arts Foundation (PAF) in St. Louis: 4562 Enright Avenue, Exquisite Everyday: 18th Century Decorative Arts Objects from the J. Paul Getty Museum, and The Ordinary Must Not Be Dull: Claes Oldenburg’s Soft Sculptures. But they raise as many questions as they answer. Whose home? What routines? Which physical structures/objects are used? The prospect is ripe with dichotomies: fluidity/stasis, divisions/confluence, asset/liability, thought/action, open space/occupied territory, vacant/inhabited, continuity/disruption, utopian/dystopian, creation/devastation, fade/appear. raumlaborberlin, the German architecture collective, is behind 4562 Enright Avenue, which transposes elements of this long-abandoned house—windows, beams, doors, staircases—into a nearly identical-sized gallery at the Pulitzer’s Tadao Ando-designed building 1.7 miles and lights years away. (Like Duchamp’s Fountain [urinal], it’s all about context.) Meanwhile, on site, the brick shell remains. At the museum, one turns the corner to encounter a facade of two stories with arched windows and a door crowned with a glass door light featuring the number 4562. You enter the first room, a living room with stately, upholstered chairs and a mantle. 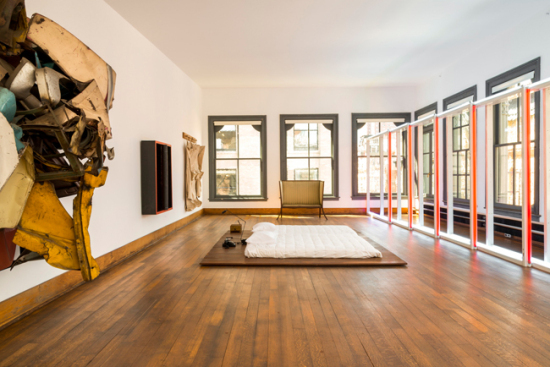 On the floor there are chalk outlines, like police evidence at a crime scene, of more furniture, that constitute the formal room from the house’s heyday—and that Jan Liesegang of raumlaborberlin imagines was barely used. The next room is filled with debris and stacks of materials precisely as found in the abandoned house in 2015. The third and last room on the ground floor imagines what could be for St. Louis housing going forward, displayed in a workshop setting with drafting table, photographs (Saarinen’s Gateway Arch), drawings (Pruitt-Igoe), and books (including Mapping Decline by Colin Gordon), all of which can be handled by visitors. Two staircases—one front-of-house and one for service—lead to a second floor that sports a suspended sink, wooden slat backboards, and, in contrast to the found objects and materials, a new pod-alike intervention. The pod is wrapped in white-painted newsprint in a neatly folded, scale-like pattern, around a translucent rectangular oculus lit from within. This belongs to Liesegang’s fanciful occupant of the house, an imaginary scientist. Since visitors cannot climb the stairs, this apparition remains mysterious. Shelves and tables outside the house are workstations and a video display showcases interviews with residents and neighbors of Enright Avenue. raumlaborberlin: 4562 Enright Avenue - Time-lapse from Pulitzer Arts Foundation on Vimeo. The process of creating this display was nearly a year in the making. raumlaborberlin, whose name means “space” + “laboratory,” is known for projects in transitional urban spaces that combine architecture, urban planning, landscape architecture, and art (See Spacebuster at Storefront for Art & Architecture and the New Museum’s Festival of Ideas for the New City, 2008 & 2011). St. Louis was described to me as a fetishized Detroit, a city where, in certain neighborhoods, lots are vacant and houses are abandoned like missing teeth, directly alongside occupied homes. The description painted a hollow urban center—the City of St. Louis—ringed by a suburban collar and the County of St. Louis (Ferguson is in the County). St. Louis is recovering from a long slide of white flight coupled with the decline of manufacturing and Mississippi River traffic. It’s a long way from the city’s role as Gateway to the West, the start of Lewis and Clark’s journey. The city is also bisected by Delmar Avenue; Enright Avenue is one block north (where 98% of residents identify as black, median home value is $73,000, and median annual income is $18,000), whereas Washington Avenue, where the Pulitzer is located, is one block south (where 73% of residents identify as white, median home value is $335,000, and median annual income is $50,000). To raumlaborberlin, this urban divide was familiar from the Berlin Wall in their home city and seen as hopeful since that barrier is now a memory after the wall’s demise 27 years ago. Asked to address the ways that we inhabit the urban landscape, and specifically engaging St. Louis and its residents, the collective zeroed in on the Lewis Place/Vanderventer neighborhood and its contemporary ruins. (Interestingly, A.E. Hotchner’s coming of age book, King of the Hill, was written about his childhood in a seedy hotel at Delmar & Kingshighway, a few short blocks away.) Together with neighbors and the City of St. Louis Building Commissioner, this uninhabited, structurally unsound Romanesque/French Renaissance Revival house built in 1890 (and slated for demolition) was selected. To shine a light on issues, they decided to move the building to the museum in order to reimagine the structure and what might replace it. It is meant to pose questions, rather than answers. A key one Liesegang asked is “How much can you take away from a house and it's still a home?” Exquisite Everyday: 18th-Century Decorative Art Objects from the J. Paul Getty Museum at first seems to be the antithesis of 4562 Enright. But it signifies someone else’s “everyday,” in this case upper class French and Italians. These objects—sauceboat, armchair, wall sconce, carpet, basin and ewer, chamber pot—are beautiful, ornate, and highly crafted, yet represent changing styles and practices. The sauceboat, for example, shows a more casual buffet style where diners helped themselves, rather than relying entirely on footmen. The objects for personal hygiene were used for ablution, rather than bathing by submersion, which was considered unhealthy. One can imagine their equivalents at 4562 Enright Avenue, when it was first inhabited by middle-class Germans, and then by black residents in the 20th century. Claes Oldenberg’s soft sculptures in The Ordinary Must Not Be Dull depict household objects including light switches, key, tires, 3-way electric plug, clothespin, ice bag, folding chair, and an array of food that includes french fries, baked potato, and green beans. Oldenburg shines a light on the everyday, making us look at the familiar in unfamiliar ways. In addition to exaggerating their size by inflating them to a vast scale, he also questions the traditional notion of sculpture’s substance by making them soft and pliable, rather than of more conventional hard, solid materials. 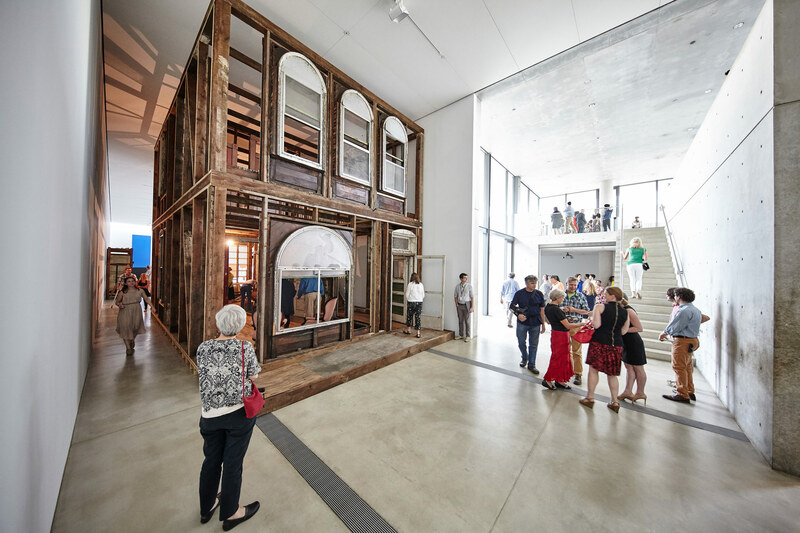 The Pulitzer has a tradition of engaging the city, starting with The Light Project (2008), a series of public art commissions; Urban Alchemy/Gordon Matta-Clark (2010) by Theaster Gates, Robert Longer, and Jenny Murphy; and Crossing the Delmar Divide (2012-14), a 2-year project with the Missouri Historical Society and the Anti-Defamation League addressing racial and socioeconomic disparities. PAF’s work will continue with PXSTL, a collaboration with Washington University’s Sam Fox School of Design & Visual Arts, that has commissioned a site-specific temporary structure for community-based programs and events by architect Amanda Williams and artist/educator Andres Hernandez to open in May 2017. Director Cara Starke, who previously served as Director of Exhibitions at Creative Time, spearheaded the raumlaborberlin commission when she assumed the position one year ago, so we can look forward to continued inquiry into the built environment from the Pulitzer. Pulitzer Arts Foundation 3716 Washington Boulevard St. Louis MO 63108 raumlaborberlin: 4562 Enright Avenue Exquisite Everyday: 18th-Century Decorative Arts from the J. Paul Getty Museum The Ordinary Must Not Be Dull: Claes Oldenburg’s Soft Sculptures All exhibits on view through October 15, 2016. The building, he said, stands as a “triumph of private enterprise in such a publicly conspicuous place.” Now, he concluded, “a new Trump flagship sails into these troubled civic waters, carrying with it more than a faint air of a floating casino, or perhaps the winnings from one.” But elsewhere he wrote that it could have been worse. True, the design could have sported dollar-sign finials, a one-armed-bandit handle sticking out the side, window shades painted with cherries, oranges, and lemons, and a pile of giant Claes Oldenburg coins at the base instead of the scaled-down version of the Unisphere. Or maybe that would have been an improvement. Refinement was never this building’s point anyway. The 725 5th Avenue Trump Tower exterior, with 28 sides, was designed by Der Scutt, of New York’s Poor, Swanke, Hayden & Connell, and was equally criticized by Muschamp, who concluded, “everything [about it] is calculated to make money.” This, of course, was seen as a positive design value by Trump, who argued that the faceted facade gave every room two views and therefore made them more valuable. In fact, the designs of Trump’s buildings are driven solely by profit. Is this unusual for commercial construction in New York? Of course not—but Trump’s buildings are such obvious, in-your-face examples of this reality of how the city is being built in the 21st century. 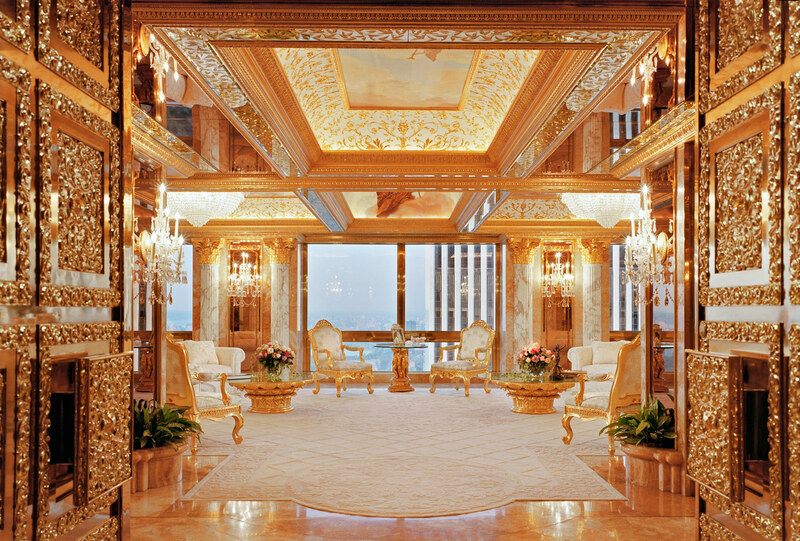 Beyond the large, expensive brass “Trump” lettering that adorns his buildings, Trump has made a career of taking advantage of public subsidies and then putting up the cheapest-looking project possible. His re-skinning of the Penn Central Transportation Company’s 2,000-room, Warren and Wetmore–designed Commodore Hotel is an example of one such project. Here, he took a perfectly decent—even handsome—1919 brick-and-limestone building, next door to Grand Central Terminal, and clad it with a reflective glass that has not weathered well. The project, rebranded by Trump as the Grand Hyatt Hotel, was done by one of his favorite architectural firms, New York’s Gruzen & Partners, with Der Scutt. The architects did not remove the old facade but instead overlaid a bronze-colored glass set in a grid of dark anodized aluminum. Trump spoke about that facade in The Art of the Deal; he was “convinced that half the reason the Commodore was dying [was] because it looked so gloomy and dated and dingy.…[He] wanted a sleek, contemporary look. Something with sparkle and excitement that would make people stop and take notice.” It’s not that the business barons of yore, such as Cornelius Vanderbilt, the developer of Grand Central Station, were not concerned with profit, but Vanderbilt and his architects, Reed and Stem, as well as Warren and Wetmore, designed a handsome public work of architecture, whose striking stone gateway’s presence makes Trump’s glass skin seem cheap and dated. The building has one of the worst 1980s-era facades in New York. Beach Haven, like so many other federally financed affordable projects, was forbidden by the National Housing Act of 1934 from including any extra architectural details or embellishments, something the national real estate industry worked to have included in the law. Though it has directness to its design and some sort of dignity missing from Fred Trump’s Manhattan buildings, Beach Haven is nevertheless a standard New York City complex of stripped down, bland six-story brick boxes, spread across a city grid. It—like his son Donald’s later projects—was a profit-seeking opportunity. The FHA later discovered that Fred Trump had pocketed over $4 million in illicit profits from the construction. Donald would later put up (or at least put his name on) a similar sort of development, along Riverside Drive just north of 57th Street. Like Beach Haven, Riverside South is a series of bland rectangular boxes spread across a series of city blocks. Though here, rather than looking out over Coney Island, the development looks toward the river. The detailing of these riverside buildings is faintly art deco, recalling their Upper West Side neighborhood in their massing and repetitive walls. This was also the site for Trump’s proposed Television City, which could have been even worse, or at least more massive. In 1974 to 1975, Trump proposed to develop Television City—with 4,850 apartments, 500,000 square feet of retail space, one million square feet of office space, a 50-room hotel, television studios, parking for 3,700 cars, and 28 acres of open space—in a largely abandoned old train yard. The original scheme, which proposed a large superblock of high-rise towers, with a three-armed telescoping tower, was designed by Murphy/Jahn Architects, of Chicago, and would have been the tallest tower in the world, at 1,670 feet and 150 stories. It was a massive development, with several towers over 70 stories, all built on a podium over the old rail yards and a park. The West Side Highway would have been relocated under the towers to create a road not unlike the one under the Brooklyn Heights Promenade. Needless to say, there was opposition to this new complex. The world’s tallest building, many thought, was never meant to be built, but was a ploy, a wedge to get more square footage in the plan approved by the city. Trump, on the other hand, was his typical ebullient, promotional self and called the plan, in a press release, “the master planner’s grandest plan yet.” Because Trump, more than any builder in New York in the late 20th century, has transformed the city with barely the slightest architecturally-worthy design or public service. A custom architectural enclosure composed of 200 CNC-milled custom aluminum extrusions. While the design concept evokes a literal image of a wood plank, the detailing of the facade components produce a sophisticated, robust assembly. The architects designed the fence as a system of extrusions serving as both the skin and the structure. Working with Sapa Extrusions, the team designed and produced a custom dye for production of a unique aluminum extrusion for the project, ultimately yielding around 200 repeatable components that bolt together on site. Ball said a lot of design and engineering that went into the individual extrusion. The team designed in fins on the front side, with larger struts on the back side, producing enough structural rigidity to withstand a subtractive CNC milling process. A wood grain patterning is registered in the surface by milling out selective areas of the panels. When viewed frontally, glimpses of the ballpark can be seen, however when viewed obliquely, large struts block openings while providing surface area to reflect a soft glow of daylight. Ball notes interesting similarities to the tectonic assembly of some segments of the US/Mexico border fence, only a quarter mile from the site. "You can't blow anything up to a colossal scale without thinking about Claus Oldenberg," said Ball regarding the literal reading of a picket fence in their fence facade. "We've never used that as a strategy before in our work. This still has to function as a fence, and we still value things like detailing, tectonics, connections. In contrast to Oldenberg's work, we occupy an "unusual gray zone" between architecture and public art.” Ball says his studio is ultimately is interested in craft of building regardless of typology. “We're looking for the right challenges, and the right people to work with. Are they willing to take chances? Do they believe in our process? That could apply to buildings or public art.” CORRECTION: Neal Feay Company was originally omitted from our list of Project Credits. The studio played a significant role in the machining process, providing specialty fabrication and consultation for the “Not Whole Fence” project. The unusual structure is meant to give a sense of place to a diverse neighborhood. In East Baltimore, three artists have created a pushpin-on-steroids to put an oft-forgotten community on the map and welcome new residents to the area. The big red pushpin is the main feature of a bus stop that was erected this fall in the Baltimore Highlands neighborhood. The oversized pin juts into the sidewalk at an angle, as if it’s pinning the shelter to the ground. On the shelter’s undulating roof is the Spanish phrase, estamos aquí (“We are here”), a nod to the many Spanish-speaking residents who have moved into the area. “We decided to do the pushpin as a statement about putting our neighborhood on the map,” said artist and Baltimore Highlands Neighborhood Association co-president Rachel Timmins, who designed the bus stop. “We have the most diverse population in Baltimore City but we have a very large Latino population, so we really wanted to highlight that. We want to be inclusive,” said Timmins. Timmins said her rowhouse neighborhood doesn’t get the same attention from the city as many other communities and doesn’t have many landmarks besides a nearby cemetery. The giant pushpin is clearly inspired by the work of Claes Oldenburg and the late Coosje van Bruggen, sculptors best known for public art installations featuring large replicas of everyday objects, from a pair of binoculars in southern California to a spoon that becomes a bridge in Minneapolis. Timmins said she used bright red for the pushpin because it’s a powerful, vibrant color. The “pin” is actually a repurposed light pole turned upside down, and the red top is made of a synthetic stucco material. The shelter itself is a utilitarian structure with metal posts, a wooden bench, and an open space for someone in a wheelchair. Its roof undulates like a fluttering piece of paper that needs to be held down by a pushpin. The intersection of Baltimore Street and Highland Avenue was selected as the setting for the artwork, Timmins said, because it’s a busy location, serving four city bus routes. From the start, it has gotten heavy use. As soon as the artists completed their installation, people started gathering under the pushpin shelter to wait for their buses. “I love it,” said Laura Irvizu, who lives nearby. The project is a collaboration of the Southeast Community Development Corporation, local residents and artists of the Highlandtown Arts District and Association. 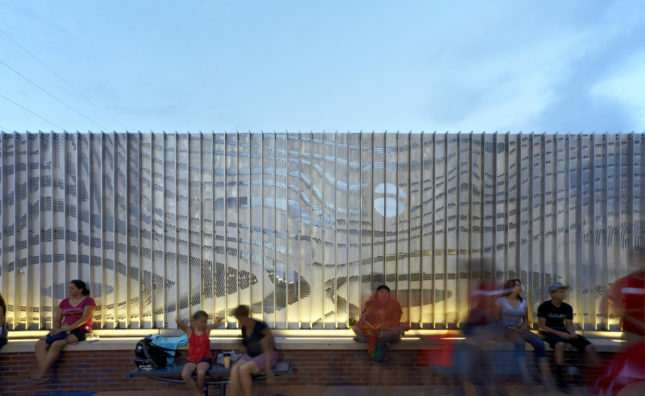 The bus stop design won a $25,000 PNC Transformative Art Prize for 2015. Timmins collaborated with two other artist-engineers, Kyle Miller and Tim Scofield, to fabricate the shelter, mostly off-site. 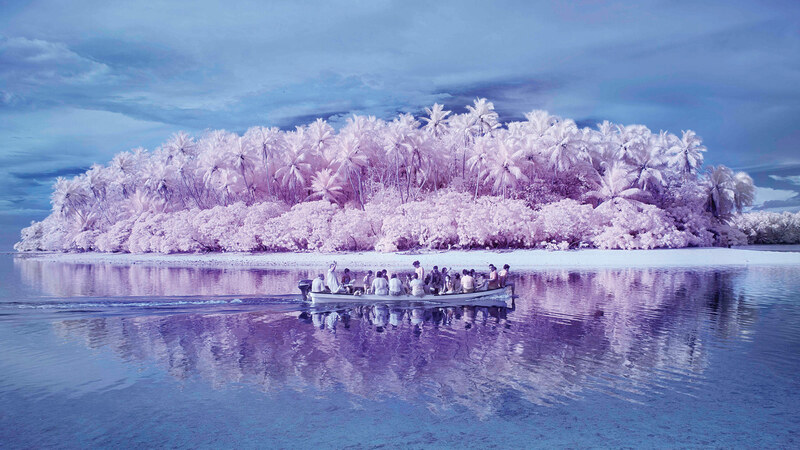 Her work has been shown in numerous exhibitions, both nationally and internationally, and in many publications, including Unexpected Pleasures from Rizzoli, Contemporary Jewelry in Perspective published by Lark Books, and Jewel Book: International Annual of Contemporary Jewelry Art published by Stichting Kunstboek. 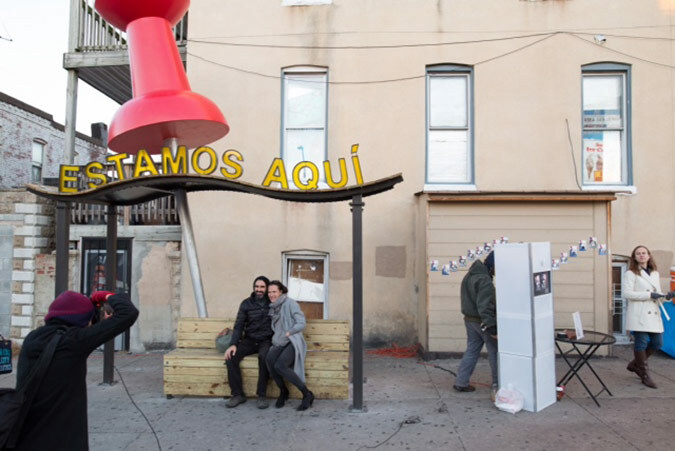 Miller and Scofield are Baltimore sculptors who collaborated last year with the Madrid design collective Mmmm… to create another sculpture in nearby Highlandtown, a bus stop and pedestrian shelter that consists simply of three letters: B-U-S. The PNC Transformative Art Prize is a program of the Baltimore Office of Promotion & the Arts, made possible through a partnership with PNC Bank and Baltimore’s Housing department. Other funding included $5,000 from the Baltimore Community Foundation and $5,000 from Healthy Neighborhoods. Archtober Building of the Day #20 Donald Judd Home and Studio 101 Spring Street Architecture Research Office; Walter B. Melvin Architects The Soho of the 1970s has come and gone, grungy artists’ studios replaced by glitzy storefronts and luxury condos. However, two decades after artist Donald Judd passed away in 1994, his presence still permeates 101 Spring Street. It’s in the nooks he carved out for his children and his books, his kitchenware and furniture, and, most of all, his art. To Judd, 101 Spring Street was love at first sight. He purchased the cast-iron corner building in 1968 and was careful to respect the integrity of the space when setting up his life and his work. Dividing walls are kept at a minimum, and everything is arranged to leave the right angles of the windows uninterrupted. Light generously floods the interiors. 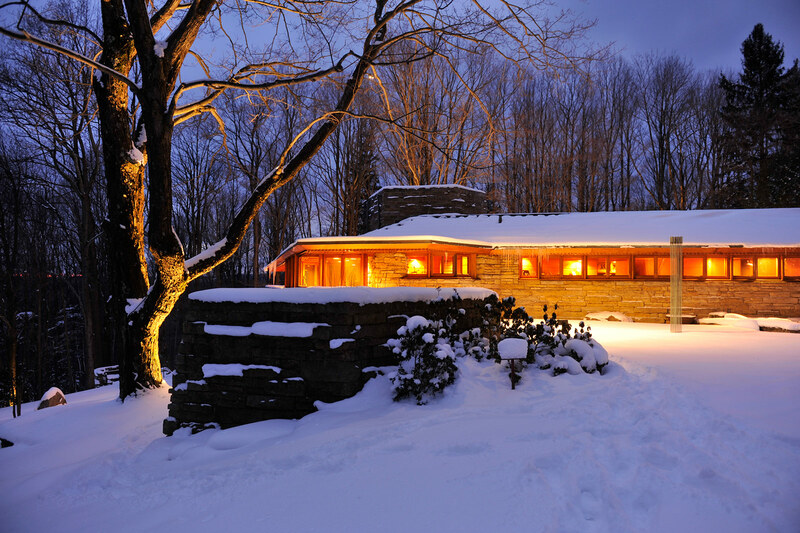 Though not an architect, the godfather of Minimalism knew a thing or two about arranging spaces. Somehow, in the master bedroom, a site-specific Dan Flavin light installation coexists in harmony with works by Claes Oldenburg and John Chamberlain. Despite the sleek metal surfaces of his work, the range of surfaces and textures in his home reveals the breadth of his taste. The restoration, led by Architecture Research Office (ARO), was guided by Judd’s last will and testament: make necessary repairs, but leave the rest unchanged. Restorers looked through old photographs and arranged walk-throughs with Judd’s friends and visitors to determine the precise location of artworks and furniture, and everything in between. There was probably more clutter when Judd was around, but, according to our Judd Foundation guide, the artist had his own organizational systems in place. A custom-made cabinet with a very low shelf was specifically designed to store cutlery side-by-side in a single row. According to ARO Principal Adam Yarinsky, the restoration’s main challenge was how to introduce the modern infrastructure of museums without impacting the character of the building and its art installations. In the 1960s, Judd removed all sprinklers from the third and fourth floors, claiming that they interrupted the building’s sightlines. ARO consulted with Arup to devise a fire-proofing system that would not detract from the space’s qualities. Walter B. Melvin Architects, which led the facade renovation, installed new but old-timey double-paned glass to protect the art from harmful UV rays. Judd is gone, but his art and his legacy live on. The artist’s careful considerations, along with ARO’s precise renovation, allow the spaces to showcase the art and vice versa. Camila Schaulsohn is Communications Director and Editor-in-Chief of e-Oculus. She was born and raised in Santiago, Chile. 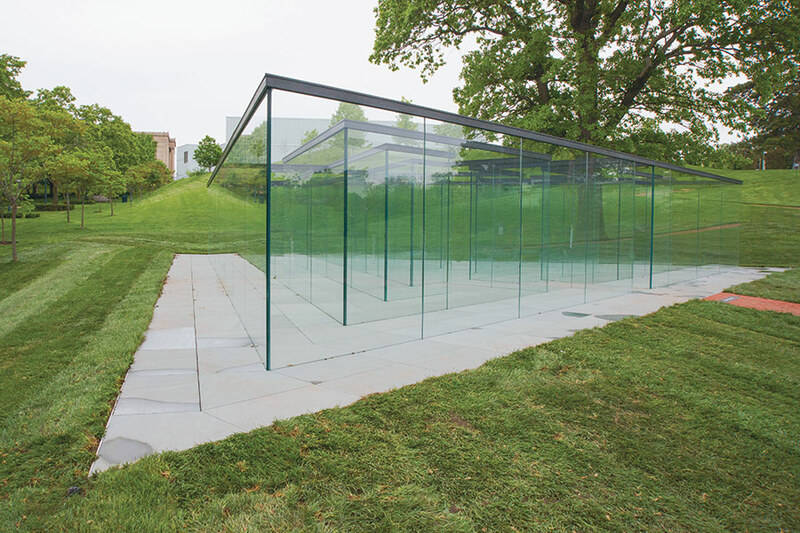 On May 22, the Nelson-Atkins Museum of Art in Kansas City, Missouri, unveiled the newest addition to its 22-acre Donald J. Hall Sculpture Park. Entitled Glass Labyrinth, the glass walled maze designed by world-renowned artist and Kansas City native Robert Morris follows a series of similar installations made over the past decade from various materials including steel, stone, and even chain-linked fencing. 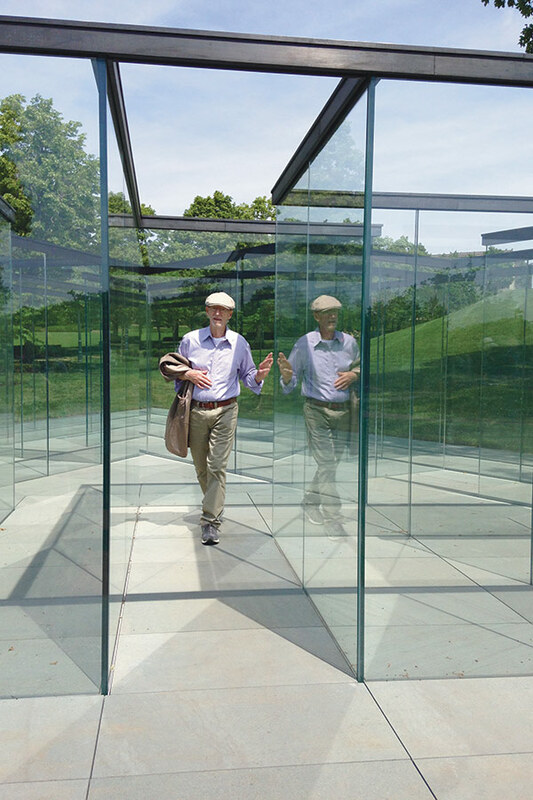 “This interactive and contemplative labyrinth sets the stage for an exciting future for the sculpture garden, the museum, and Kansas City,” said Julián Zugazagoitia, the Nelson’s Director, at the ribbon cutting of Morris’ first permanent glass work in the U.S. The Nelson is celebrating the 25th anniversary of the sculpture park with the opening of the new commission, funded by the Hall Family Foundation of Hallmark Cards fame. In 1986, the Foundation bought 57 master works by artist Henry Moore from an Oklahoma oil tycoon. 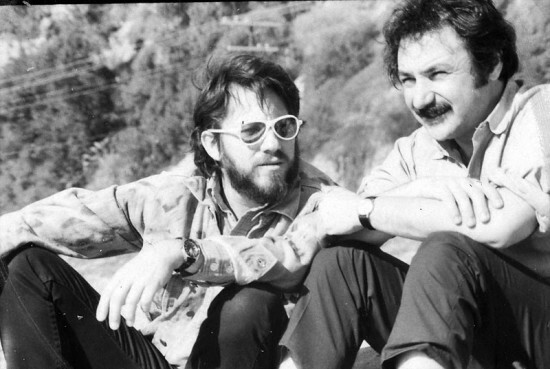 They approached the Nelson shortly thereafter, and by 1989 had collaborated to build an outdoor museum in the spirit of the Foundation’s mission of creating places for the public to experience the relationship between art, architecture, and nature. 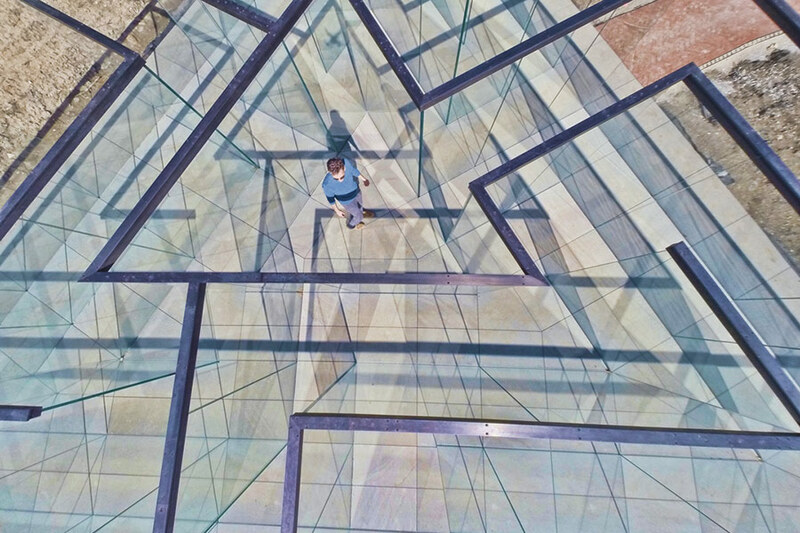 At 7 feet tall and weighing more than 400 tons, Glass Labyrinth is a 62-foot equilateral triangle–shaped maze. 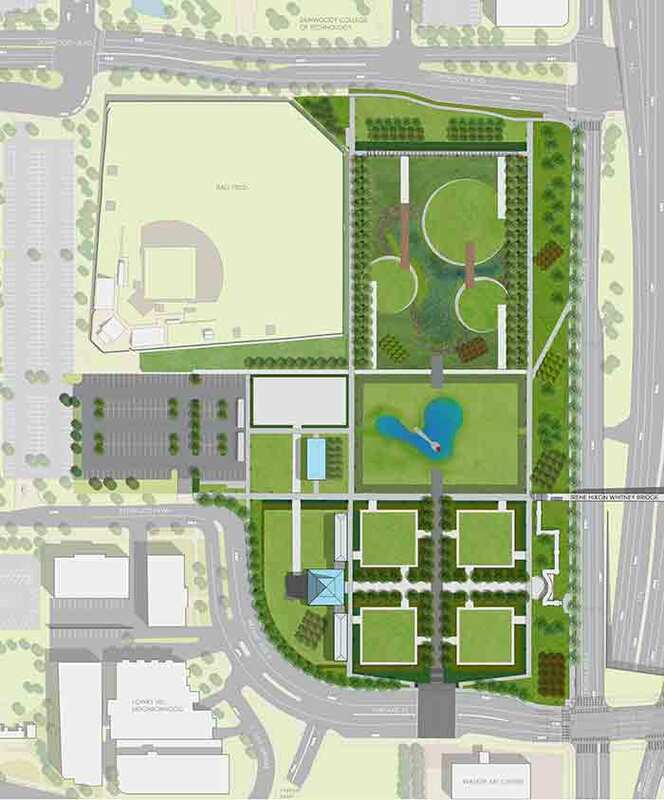 Considering the museum’s desire to have the commission take a prominent position on the grounds, and with limited space left in the sculpture park, the Nelson’s landscape architect, Rick Howell, had to be strategic about the work’s placement. The permanent installation is located at the foot of the museum’s Bloch building, designed by Steven Holl Architects, and creates a gateway element at the southeast corner of the campus. Glass Labyrinth responds to the purity of the original building and the Holl addition. The piece’s translucence creates an interesting juxtaposition between the backdrop of the Bloch building’s frosted, channelized glass, and its adjacency to Henry Moore’s bronze Sheep Piece, with Roxy Paine’s stainless steel Ferment lurking over the scene and across from Claes Oldenburg’s infamous Shuttlecocks. 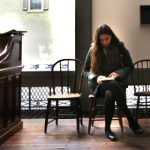 This is not a typical museum piece, where guests are discouraged from touching the art. “Visitors are invited to walk into the labyrinth to experience it and become a part of the art,” said Jan Schall, the Nelson’s Sanders Sosland curator of modern art. The concrete foundation for the labyrinth was laid last Fall, and final assembly began in April. It was completed in early May. The Nelson has organized a summer of public activities to celebrate the sculpture garden’s anniversary.